The Youth Super Sprint division at the 2014 Leukaemia & Lymphoma Research Blenheim Palace Triathlon yesterday saw Alex Chantler-Mayne defend his title from 2013 and hold off the fast running Ben Dijkstra to take another Blenheim win. For the Youth Girls, Kate Waugh contined with her superb season. 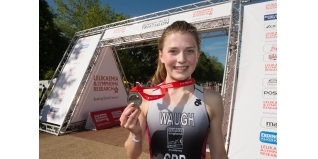 A winner at the British Youth Duathlon Champs in Corby, she also won the British Youth Aquathlon Championships last weekend in Hyde Park. We captured some video footage from the finish line below.